Just put 'Francine Milford' in the search box. There are several video clips for you to view. Students in the Tuning Fork Therapy®, Level One class learn how to use double forks to achieve a variety of stimulating or sedating responses in the body. Using the High 'C' tuning fork at the Soul Star Chakra and the 'D' tuning fork at the Sacral Chakra will stimulate the reproduction organs, balance the appetite, and stimulate the assimilation of food in the body. Be sure that the tines of the tuning fork are flat facing the area or chakra that you are working on. Marissa Vaudo uses the Double Fork Technique in the image below. NOTE: If your tuning fork does not vibrate for at least 10 seconds, then you are either holding your tuning fork too tightly or you are placing the tuning fork too roughly on the body. It takes practice to activate and hold your tuning fork with just enough pressure to keep it vibrating. 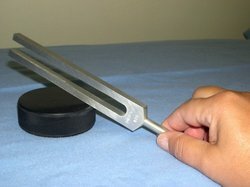 When using an unweighted tuning fork, measure 2/3 of the way down the tine and activate the tuning fork against the surface of a hockey puck. You can also use the palm of your hand or the front of your thigh for softer activation. When using a weighted tuning, you can just activate it in the palm of you hand. 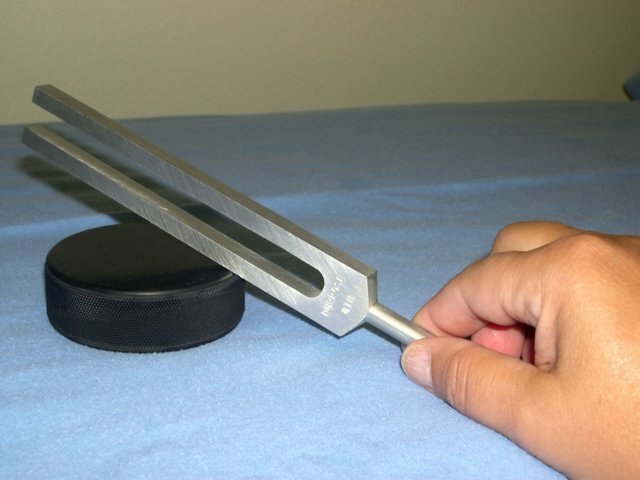 For more information on acticating your tuning fork, please read the Tuning Fork Therapy© Level One manual.